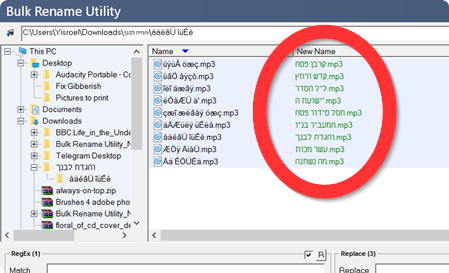 I have a folder full of sub folders and files which are named using Hebrew encoding (Windows XP - Windows-1255). 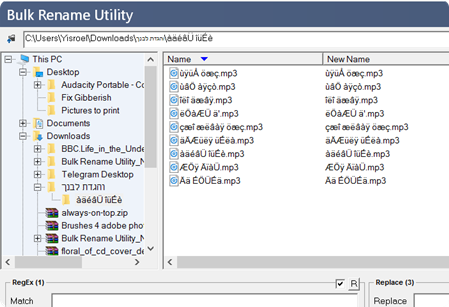 I now use Windows 7 and I want to convert all file names into UTF (Native Windows 7 which supports Hebrew characters). Is there a tool to do so automatically? Pay attention, I'm not after converting the internals of the file, only its file name. What is needed to be done to fix this is to find some way to automatically know each of these Gibberish characters which Hebrew character they were before being getting that way. à=א á=ב â=ג ã=ד ä=ה å=ו æ=ז ç=ח è=ט é=י ê=ך ë=כ ì=ל í=ם î=מ ï=ן ð=נ ñ=ס ò=ע ó=ף ô=פ õ=ץ ö=צ ÷=ק ø=ר ù=ש ú=ת ‚=ג „=ד ‡=א ˆ=צ ‰=ה ˜=ק ¯=ר Á=ח Â=ו È=י Ê=ז Ë=ט Ì=ם Í=ך Î=כ Ï=ל Ò=ס Ó=מ Ô=ן Ù=פ Ú=ע Û=ף Æ=. ¨=, ß=' ¢="
Open the programs and browse to the folder containing all the files with this kind of names. In the Filters section, place a checkmark at Subfolders if you want to do more then one folder at a time. Select all files and folder in the list (you should see the name it'll become after renaming it in the 2nd coulmn) and click Rename. And now all names should be displyed in Hebrew! Windows stores file names on disk in UTF-16 (two-byte code units, variable-length) encoding. This applies to FAT, FAT32, NTFS and exFAT. It's unlike Linux/FreeBSD where filesystems have one-byte encoding, and it can be Windows-1255, UTF-8, ISO-8859-* etc. UTF-16 is converted to ANSI (one-byte encoding) by Windows for some old non-Unicode software which is using old system calls like FindFirstFileA(), FindNextFileA() instead of new system calls FindFirstFileW(), FindNextFileW(). So all you need on Windows is to change "language for non-Unicode programs" setting in Control Panel / Regional and Language Settings. On-disk data is not affected.